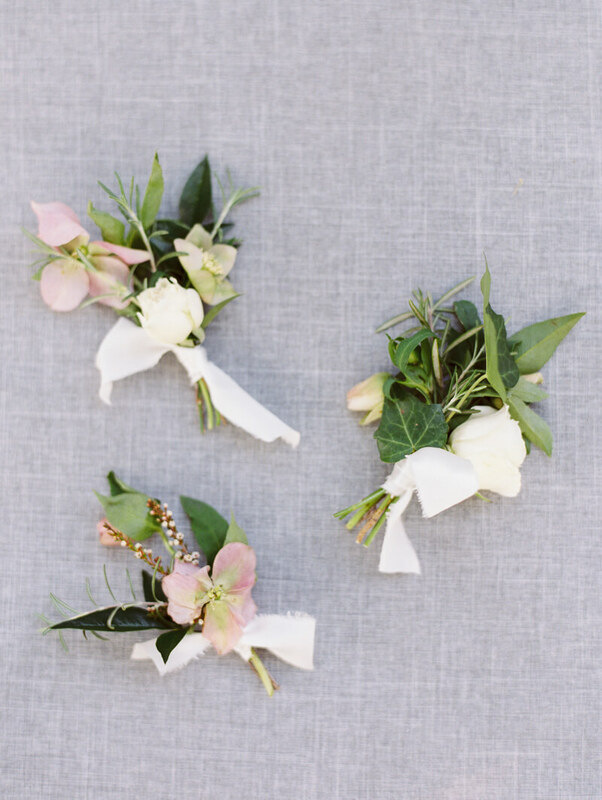 Founders Garden Wedding Inspiration. 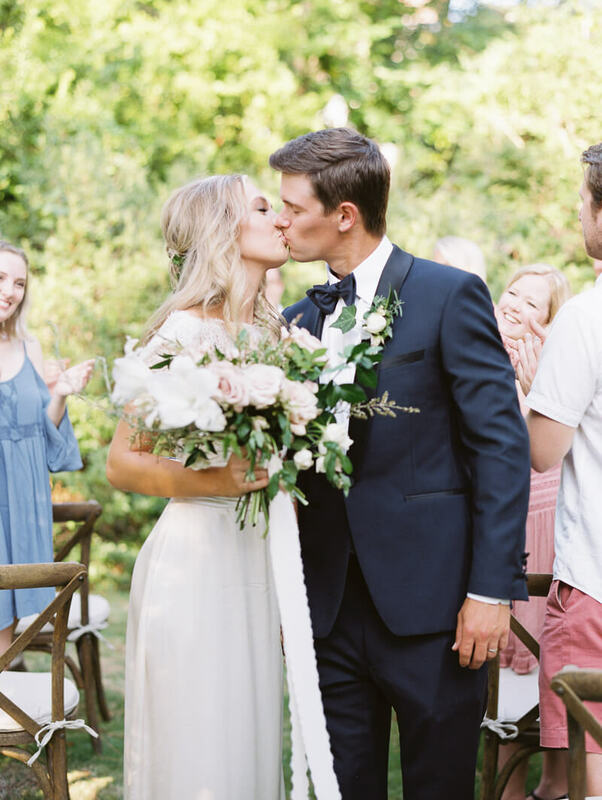 Nestled in the heart of Athens, Ga., is the Founders Garden, where this styled wedding inspiration comes to life. But natural beauty aside, this styled shoot takes on a whole new aura thanks to the anticipation, joy and excitement captured in the experience. The romantic paper suite features a spectrum of cool, relaxed colors. Modern script and watercolor designs round out the collection. The couple wrote their vows in a gorgeous vow book to read from at the ceremony and cherish as a keepsake long after. The bouquet features light pink roses, lilies and assorted greenery tied with white ribbons. The florals match the delicate aesthetic of the bride’s lace gown. With short sleeves, an open back and a flowing silhouette, the bride is simply ethereal. She’s styled with a dewy, natural palette that is light and soft. The groom is dashing in a classic tuxedo complete with a bow tie and boutonniere to match the bride’s bouquet. The ceremony is as authentic as one can imagine with an intimate gathering of guests looking on towards the happy couple. The bride and groom exchange vows, wash each other’s feet, share laughs and a kiss. They celebrate with their close friends and family over a meal shared from a family-style table. The tablescape includes green glassware, white china and gold flatware. The metallic matches the taper holders for a cohesive decorative touch. Delicious grapes, cheese and crackers make an elegant offering for this small group of guests as they dine under the luminosity of string lights. The couple take a spin and admire one another under the gentle Georgia sunshine. And the expressions on their faces certainly say it all. This styled inspiration aims to emphasize the emotion a couple experiences on their big day. It’s the commitment that makes the day truly splendid. While the decor, fashion and food are certainly nice, it’s best enjoyed by those who see the beauty in the experience. Photo:Hannah ForsbergStyling and Creative Direction:Rachel Slauer WeddingsFloral:Gold and BloomHMU: Erin RyserGown:Fabulous Frocks of AtlantaTux:Modern GentRentals: Oconee Event RentalsRings:GoodstoneVow Books: Wedding Story WriterCalligraphy:Quill and Co.